Lexington, Ky. – Laura Graves and Verdades have advanced to the number two spot in the FEI World Dressage Rankings after a successful showing at the 2017 World Equestrian Festival CHIO Aachen in July. This equals the highest ranking ever by a U.S. dressage combination. Germany’s Isabell Werth and Weihegold OLD remain world-ranked number one. Great Britain’s Carl Hester and Nip Tuck are ranked third. Previously, Graves (Geneva, Fla.) and the 2002 KWPN gelding, who defeated Werth and Weihegold OLD in the Grand Prix Special in CDIO5* Aachen, held the number four spot since August 2016 following the Rio Olympic Games where they won a team bronze medal and placed fourth in the Grand Prix Freestyle. 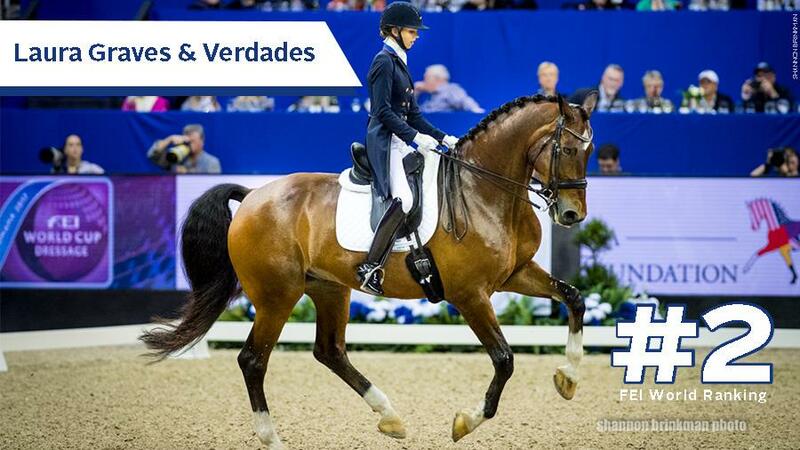 Graves and Verdades first appeared on the world standings in February 2014, ranked 458th, after their first two international competitions at the Adequan® Global Dressage Festival. U.S. combinations Steffen Peters and Ravel were world number two in June and July 2009, and Debbie McDonald and Lisa Wilcox were frequently world number two from 2003 to 2005. This entry was posted in FEI & USEF Dressage News, South Florida News on August 6, 2017 by ludlumfarms.